Patrick Lefebure (ArchiPL Architects) designed the new Kasteelplus building in Sint-Denijs Westrem. As part of the Sint-Camillus psychiatric hospital, this centre focuses on complete addiction care. The design of Kasteelplus shows better than anything else that the removal of the alienation between patient and surroundings is an eminently architectural and spatial task. Kasteelplus is a fully-fledged department of the Sint-Camillus psychiatric hospital, which is located in a residential suburb on the outskirts of Ghent. This department is nevertheless marketed with its own name and website. The independence of addiction care as part of the whole range of mental health care was already launched in 1985, when Sint-Camillus started up a separate department for the treatment of alcohol and medication addiction. Until then patients at Sint-Camillus had simply been divided between open and closed sections that were subdivided by gender disregarding any specific illness. The range of addiction care has now been expanded to include a drugs unit and a crisis unit. In the addiction care niche, Kasteelplus provides 37 beds out of 180 in the entire psychiatric hospital. The separation of addiction care in the psychiatric clinic is important because the patients who appeal for addiction care are usually in good physical condition, are mentally well-developed and are approachable in a normal way. In addition, Kasteelplus is oriented towards short stays of 1 to 2 months and voluntary admission. On top of this, the drugs unit concentrates on the 15 to 25 age group. So the target group cannot so easily be identified with mental health care and requires a course of treatment that is as normal as possible. It is noticeable, for example, that the staff at Kasteelplus do not wear white coats, so the distinction between staff and patient is not so obvious. The staff also prefer to refer to addiction as a chronic disorder rather than a psychological aberration. In this context, addiction care at Sint-Camillus has also been housed separately, first in the neo-gothic mansion and since 2009 at Kasteelplus. The design for this new building underlines the independence and normality of the addiction care in various ways. The most striking element is the location of the building at the rear of this green, wooded campus. Kasteelplus is part of the adjoining villa neighbourhood and thus enjoys a very residential environment. This detached location is quite visibly different from the other hospital pavilions that were built close to each other near the main entrance. In this way Kasteelplus distances itself literally from the clinical institution of which it is a part, but not without benefiting from its proximity for logistical support and crisis care. An additional advantage of the building’s exceptional spatial location is the potential for alternative access to the department. Kasteelplus currently has its own entrance via a side street with detached single-family homes. In this way the elements that make up the unique surroundings of Sint-Camillus are used to enable the patients to present themselves discretely. The avoidance of the main entrance to the psychiatric hospital minimises the possibility of social alienation and stigma. Having its own entrance lowers the threshold to the centre and allows admission to take place directly among people with the same requirements. The design of Kasteelplus also minimises any reference to clinical infrastructure and instead creates a welcoming, domestic atmosphere. On this point, the building effortlessly imitates several characteristics of the typical Flemish detached single-family home. It is a cubist volume with half-open patios and roof terraces, the façade is clad in traditional brickwork with protruding mortar and it is surrounded by a mown lawn. On the side facing the street, the centre is given approximately the same dimensions as the neighbouring villas and stretches out further only at the back. 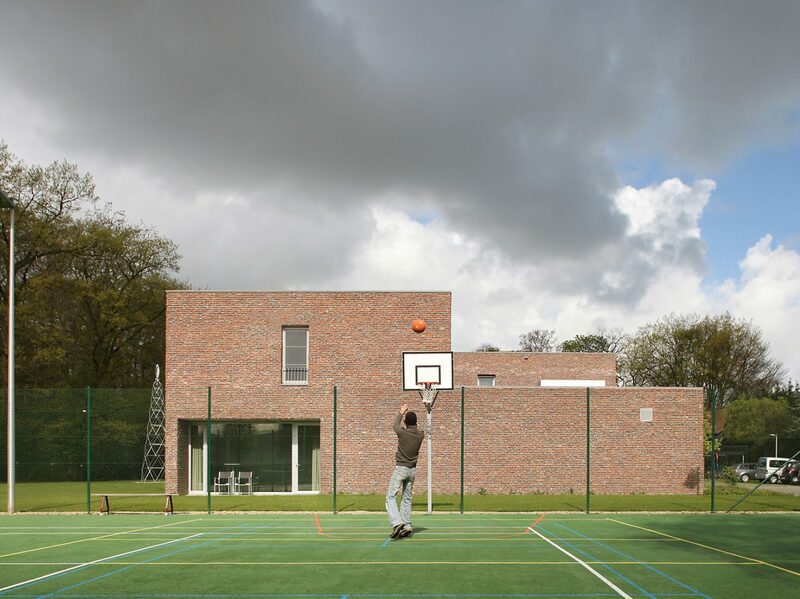 The tennis court – which had existed for a long time but was only used by local residents – also adds an extra residential element to an agreeable environment for treatment. The organisational principle behind the interior design of Kasteelplus departs emphatically from the traditional hospital corridor with its repeated anonymous rooms, opting instead to create residential and treatment communities. The ground floor contains various rooms clustered as units related to specific elements of the programme. Each unit has its own sitting room, kitchen, dining room and treatment rooms. It is striking that no reception desk of any sort is to be found. The entrance to the alcohol unit, for example (called Kasteelplus 1) opens straight into its kitchen, dining room and living room. The various elements are linked together by consulting rooms. Just as in a hotel, all the bedrooms are on the first floor, and in its turn the long corridor is opened up by means of sitting areas and terraces. The architectural and spatial isolation of Kasteelplus guarantees that the patients experience this rehabilitation centre primarily as a pleasant place to stay. The centre’s hospitable nature means that the patients are relaxed and open to the care and support the institution offers them. In this way the architectural and spatial setting forms not only the basis for well-tended accommodation for psychiatric patients, but also for the appropriate handling of a delicate building programme. The main point here is not so much the architectural differentiation of patients on the basis of their disorder, but, much more importantly, the redrawing of the boundary between the patient and his surroundings. The neighbourhood protests against the building of Kasteelplus shows that the normalisation of psychiatric care is not an easy matter. The local residents’ argument was the decrease in the value of the surrounding villa plots as a result of the increase in traffic in the street. Since the hospital property is designated as a municipal amenity, the residents’ opposition concentrated on the proposed entrance between two villas, one of which is owned by PZ Sint-Camillus. After long procedural wrangling, the recommendation by Ghent city council that the entrance should be laid alongside the railway – rejected by the hospital management on the grounds of the undeniable issue of suicide – was imposed by the Ministry of Welfare, Public Health and the Family. This change in the design shows that society and its regulatory bodies still take the clearest possible delineation of its fellow men with mental health problems as a given. Published in Psyche 23 (2), June 2011, quarterly magazine of VVGG.